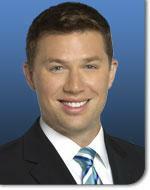 Meteorologist Brooks Garner comes to KHOU 11 from WFLA News Channel 8 Tampa. He will be the noon and 4pm meteorologist replacing Chita Johnson who moved to the morning show after David Paul moved to evenings...whoa, say all that five times fast. According to his bio, before Tampa, Garner worked at WIS in Columbia, S.C. Previously he was at KMEG Sioux City, Iowa too. Garner is a movie star too...well sort of. He played a brief role as a St. Louis broadcast meteorologist in My Own Love Song starring Forest Whitaker and Renee Zellweger (a native of Katy, TX). When not playing "Mr. Hollywood," Garner once rode his bicycle across the country in a seven-week trip from Virginia Beach to Los Angeles. He is a graduate of Mississippi State University’s broadcast meteorology program and also has a degree from the Massachusetts College of Art in Boston. He has an Emmy too.